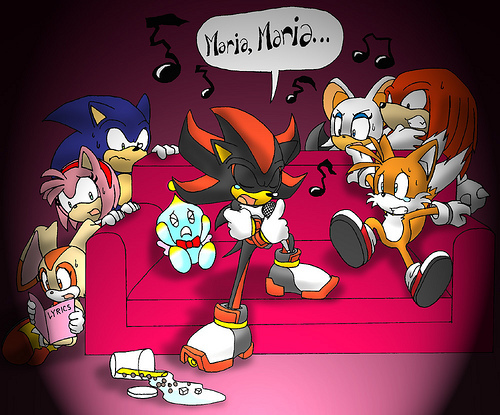 Shadow Is A Bad Singer. . Wallpaper and background images in the Sonic the Hedgehog club tagged: sonic hedgehog shadow tails knuckles amy cream funny. Evolia Wulf: "'Ow Sweeeeet! 'E can sing!" -whips out microphone- "Maaaaniic...Maniiccc...Sonia.....Son­ia.­..! Sonicccc Underrr Groundddd!" Good he can replace Justin Bieber.